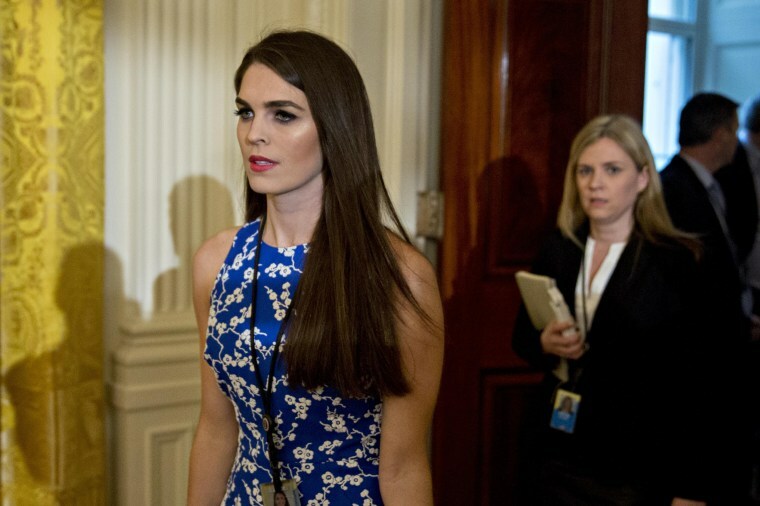 WASHINGTON — Hope Hicks, the longtime aide to President Donald Trump who’d been serving as the interim White House communications director, will now lead the communications team on a permanent basis. White House Press Secretary Sarah Huckabee Sanders told NBC News of the move Tuesday. Hicks becomes the third full-time communications director, officially replacing Anthony Scaramucci, who was fired in July, just 10 days into the job. Hicks has been with Trump since the former real estate mogul launched his presidential campaign in June 2015. Before being tapped as the interim White House communications director last month, Hicks served as Trump’s director of strategic communications. Trump has already seen a number of high-profile staff shakeups, just eight months into his administration. White House chief of staff Reince Priebus left at the end of July — the same month press secretary Sean Spicer exited after Scaramucci’s appointment. Trump’s first communications director, Mike Dubke, announced his resignation in May. Peter Alexander reported from Washington, D.C. Adam Edelman reported from New York.